Around the time of my birthday I indulged in a few meals out because it's always been one of my favourite ways to catch up with friends. On one particularly hot and sunny day, it felt like salad sort of weather. So just before I paid my first ever visit to the dinosaur park, I stopped at my local Pizza Express who in my opinion, do the best salads. We were seated outside in their garden area - which before now I had no idea existed! - which was lovely and peaceful. I had their Bosco salad which I always order come rain or shine. You just can't go wrong with mozzarella, garlic mushrooms, spinach, roasted tomatoes and artichokes, topped with dressing and dough sticks. I usually hold off the honey mustard dressing and ask for balsamic instead as I'm not too hot on mustard. It is the most colourful and aesthetically pleasing dish. For years I always dismissed salads as being highly expensive for what they are and as things that left you hungry. But now I understand. 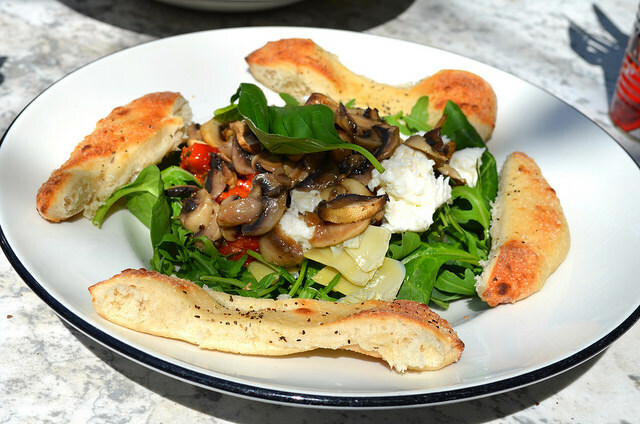 If you pick the right salad - and Pizza Express's Bosco is way up there - it can be just as filling as any other dish. I always appreciate it when a salad includes a little substance in there so it's not just a pile of leaves looking up at you. 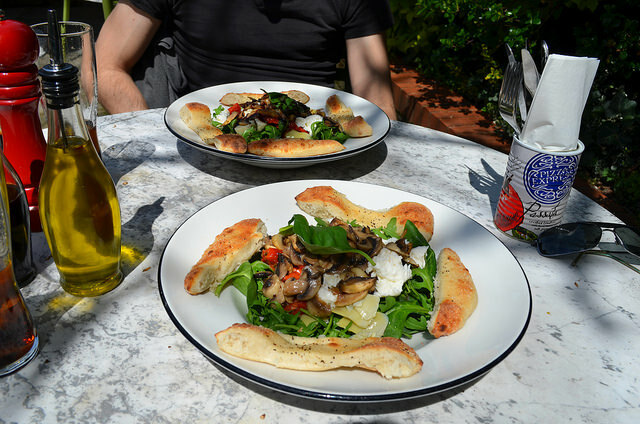 The dough sticks here are wonderfully 'springy' in texture and all the textures and flavours of the salad work together well. Artichokes are a new addition to this salad which weren't there before, nor were they something I had tasted before. And I loved them. I found the texture very similar to mushrooms and I'm a huge lover of mushrooms. Around the time of my birthday I got into cheesecake in a massive way. I was never particularly fussed with cheesecakes, now I'm all about that cheesecake life. 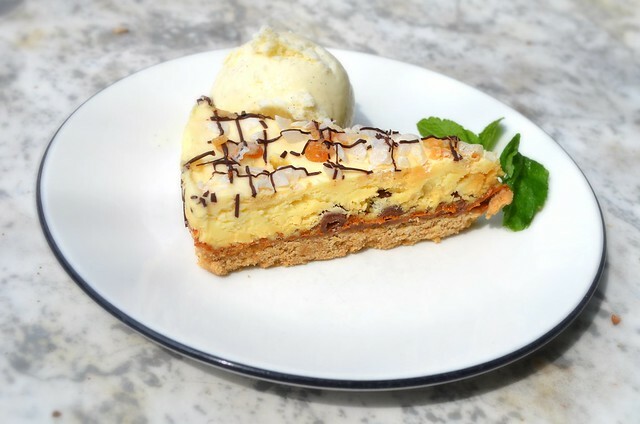 When I saw that Pizza Express had a honeycomb cream slice which included a layer of salted caramel... easiest decision ever. 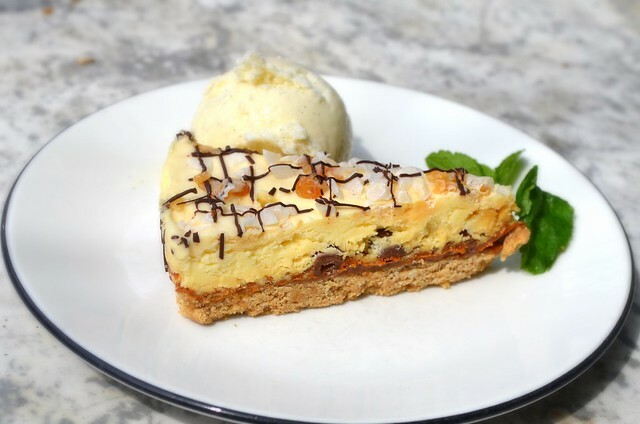 The inclusion of mushrooms in the main looks delicious - and oh my gosh, YUM to the dessert!